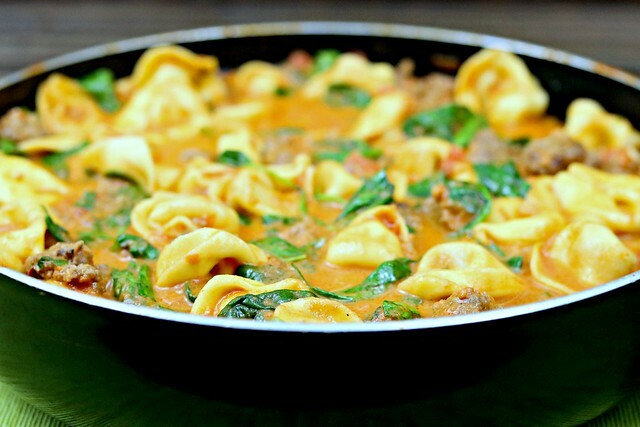 Venison sausage meatballs are combined with cheesy tortellini and a creamy tomato sauce for a one-pot skillet meal that will knock your socks off! I hope you all had a chance to check out all of the amazing posts for #BrunchWeek last week and enter the giveaway!! There were really some amazing dishes, and I can’t wait to get some of them on my menu! And how about Mother’s Day? I hope you all had a great one, whether you were celebrating yourself or another mom in your life. This was my first “official” Mother’s Day, and it was a pretty good one! Being a mom to my precious girl is definitely and adventure and a blessing! J got me some really thoughtful gifts (he’s pretty good at that), and Natalie helped me open them and was just generally a sweet girl, even though she had a nasty cold. We went to church and then met up with some of J’s family for lunch. I was glad to have had a fun and peaceful morning at home with my loves, and the only thing that could have made the day better was if I’d have been able to see my Mom and Grannie. And, I didn’t cook at all that day, which is always nice! J made breakfast, and we had some yummy leftovers for dinner. Easy peasy and minimal mess to clean up! That in itself makes a great day! This dish is one of the simplest, but most flavorful, dishes I have made in a long time. And I make it often. And if you’ve read my blog for any length of time, you’ve probably seen me mention that repeats are rare – other than when I was pregnant and just after having the baby – so for me to make something on a regular basis, you know it’s good. And super easy. Because I’m all about easy these days. Did I mention that I have a baby? Well, nearly 9 months old. Which is still a baby to me. She may be turning more and more into a big girl, but gosh doggit, she’s still my baby. Just look at that face. Gah! See why I don’t want to spend too much time making dinner each night?? Oh, and this girl loves to eat. And so far, she hasn’t really met a food she doesn’t like. Pretty much anything we’ll give her bites of, she will gladly take. I cringe sometimes when J gives her foods that I, personally, don’t like (like blue cheese – blech! ), but at the same time I’m thankful that she’s not a picky eater. Our little foodie girl. Granted, that could all change suddenly one day, I am aware, but I’m crossing all my crossables that she continues to be a good eater! Even if that means she likes yucky blue cheese and olives like her daddy. In the mean time, we are just loving sharing our food with her, and watching her learn and grow, and get excited when she sees food. It’s adorable the way she kicks her legs and her eyes get all big and she makes the cutest sounds. Nope, I don’t adore this kid or anything. Could ya tell? So, if you want an amazing meal that won’t keep you in the kitchen all night, this is the one for you. We had it last night, for the bazillionth time. And I’m having leftovers for lunch! And if you don’t have venison sausage, you can use regular Italian sausage! In a medium non-stick skillet over medium-high heat, add the sausage and use a spatula to break into bite-size "meatballs". Cook, stirring occasionally, until the sausage in browned. Reduce heat to low, then add the garlic and stir until fragrant, about 30 seconds. 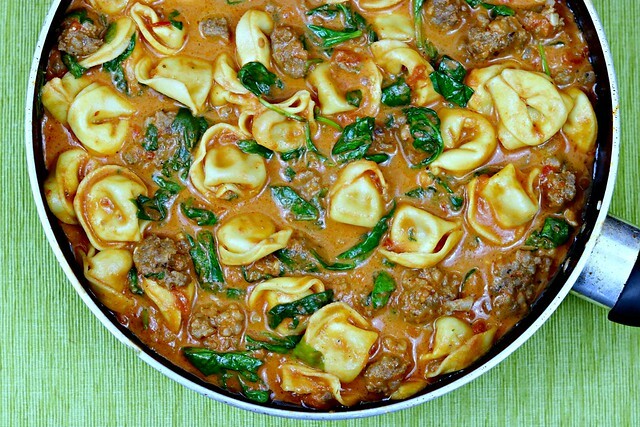 Add the broth, tomatoes, cream, and tortellini to the skillet. Stir to combine. Increase heat and bring to a boil. 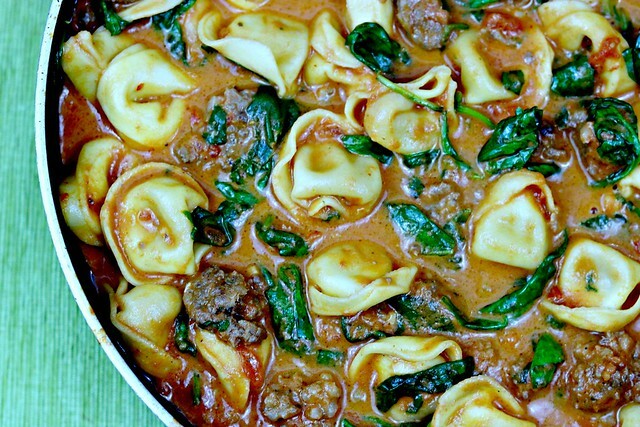 Cover, then reduce the heat and simmer for 15 minutes until tortellini are tender and heated through. Season to taste with salt and pepper, and then stir in the spinach. Remove from heat, spoon up into bowls, and serve! Made this tonight. I thought it was gonna be plain bc there’s not many seasonings but the venison and garlic gave it all the flavor it needed. My family enjoyed it. It was delicious. So glad y’all enjoyed it! It’s one of my family’s favorites.